Supporters of Brexit will learn a hard lesson – if they dare to read the following facts – yes, they are facts – with an open mind. Those who aren’t convinced should click the link to Tom Pride’s original article, where even more hard facts await them. Now, I know This Blog retains a large contingent of Brexit-friendly readers. Are any of you brave enough to admit the factual accuracy of what follows? The sad truth is, however, that your leaders – who are now in control of Brexit – have no intention of reducing immigration after the UK leaves the EU. They want Brexit so they can sell off large parts of British services and infrastructure to foreign interests outside the EU – particularly in the US and China. Yet, all many of them can keep repeating is, “You lost, get over it,” as if it were some kind of TV game show. The appalling economic consequences don’t appear to occur to or worry many of them. They are willing to sell their souls to China, the USA or Bahrain, but want nothing to do with our next door neighbours who, whether they like it or not, will continue to live just 20 miles away, and linked by a very well used tunnel. The problem with remainers is that they believe the lies misdirection and propaganda of the stronger in campaign. The difference is that remain campaigners pretend that leave voters wanted a complete end to migration, the simple fact is that all the way through leave were saying we wanted a fairer system that would allow people form outside the eu nations more chance to come here, whilst cutting the amount of unskilled unqualified people form the eu coming and driving down the wages at the bottom end of the market. It is time the remain gave up with this particular lie and got on with accepting the institutional bigotry of the eu in restrict people form outside the bloc working is something we are well shot of. I keep telling you that more people come to the UK from outside the EU than within but it doesn’t seem to have penetrated yet. Also we’re being told the problem isn’t UNskilled workers coming in, but the fact that UK companies can’t be bothered to train people up. Now that we’ve tackled the falsehoods in your comment, what about the facts provided in the article? Are they accurate enough for you, considering their sources are all available for everyone to see? 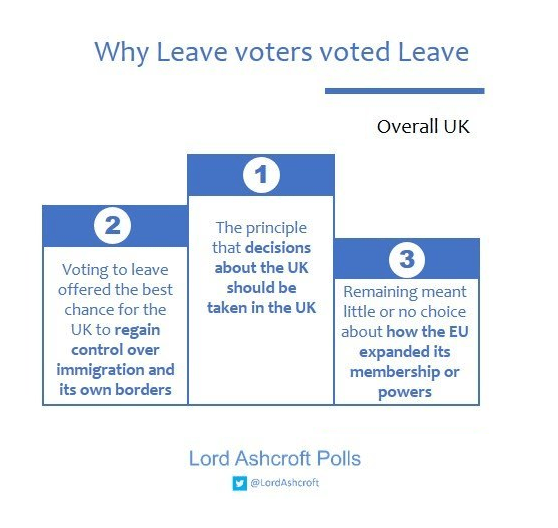 There are many reasons why people voted to leave. My question is, would any of this be any different, if we had voted to remain a part of the E.U. ?